The Insurance Institute for Highway Safety's Highway Loss Data Institute (IIHS) recently released the results of the first-ever study to determine the effectiveness of vehicle front crash prevention systems. The study, which analyzed U.S. police-reported crash data from 22 states between 2010 and 2014, found that having front crash prevention systems installed greatly prevented the occurrence of rear-end accidents. According to the IIHS study, front crash prevention systems that included automatic braking features were able to reduce rear-end vehicle accidents by approximately 40 percent, and systems that included forward collision warnings accounted for a 23 percent reduction in rear-end crashes. If all vehicles on the road had front crash prevention systems as effective as the ones evaluated in the study, there would have been as many as 700,000 fewer rear-end vehicle accidents in 2013 alone. Fortunately, while most front crash prevention systems are considered optional, the National Highway Traffic Safety Administration (NHTSA) and the IIHS are working with major auto manufacturers to make these features standard on all vehicles. Even if front crash prevention systems become standard on all new vehicle models, that doesn't turn back the clock and alleviate the suffering of those who have already been injured in rear-end crashes. 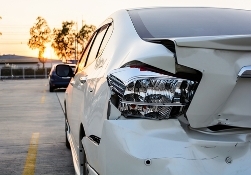 If you or a loved one were injured in a rear-end car accident, you may be facing mounting debt and a painful recovery. A knowledgeable injury attorney can help you pursue compensation for medical bills, property damage, lost wages, and more. Contact the legal team at Steinberg Injury Lawyers today for more a free evaluation of your case or to request a complimentary copy of the book, The Seven Biggest Mistakes That Can Ruin Your California Injury Case.